Between June and mid December 2015, at least 22 incidents of violent attacks were reported through out the country, affecting at least 42 persons (see timeline below). This is an increase from the January-May period, during which at least 14 attacks affecting 27 persons were recorded. Many of these attacks were perpetrated with impunity in broad daylight by police or plainclothes agents. In some cases, defenders’ family members or their private residence was targeted. “These blatant violations of the right to personal security are leaving behind a blood trail that is shockingly inimical to Vietnam’s status as a member of the UN Human Rights Council and a state party to numerous human rights treaties,” said Marie Månson, Human Rights Defenders at Risk Programme Director at Civil Rights Defenders. Vietnam abstained from a UN General Assembly draft resolution on the recognition and protection of human rights defenders. In addition to violent attacks, scores of human rights defenders and government critics remain in prison after being convicted in unfair trials under broad and vague provisions of the Penal Code. Several activists and bloggers are in detention awaiting trial, including blogger Nguyen Huu Vinh (aka Anh BaSam) and his assistant Nguyen Thi Minh Thuy, former prisoner of conscience Tran Anh Kim, and blogger Nguyen Dinh Ngoc (aka Nguyen Ngoc Gia). Seriously flawed provisions often abused to prosecute activists remain intact in the recently revised Penal Code, adopted in late November and effective from 01st July 2016. The National Assembly is considering a draft law on associations that contains highly restrictive provisions and intrusive requirements inconsistent with the right to freedom of association. Click here to download a timeline of harassments and attacks against human rights defenders in Vietnam. In a statement released on 6 January, Civil Rights Defenders joins 25 human rights society groups in calling on the Vietnamese authorities to immediately release and drop charges against human rights defenders Mr Nguyễn Vãn Ðài and Ms Lê Thu Hà, who have been in police custody in Hanoi after their arrest three weeks ago. The police have charged Ðài, a former prisoner of conscience, and his colleague Hà with “anti-state propaganda” under Article 88 of the Penal Code, which carries a prison sentence of between three and 20 years. The signatories have also highlighted concerns that the two defenders may be at risk of torture and other ill treatment in detention. Ðài was still recovering from injuries he sustained ten days before his arrest when he and three other activists were viciously attacked by stick-wielding, masked assailants in Nghe An province. The police have reportedly denied Ðài access to his lawyer and family members. 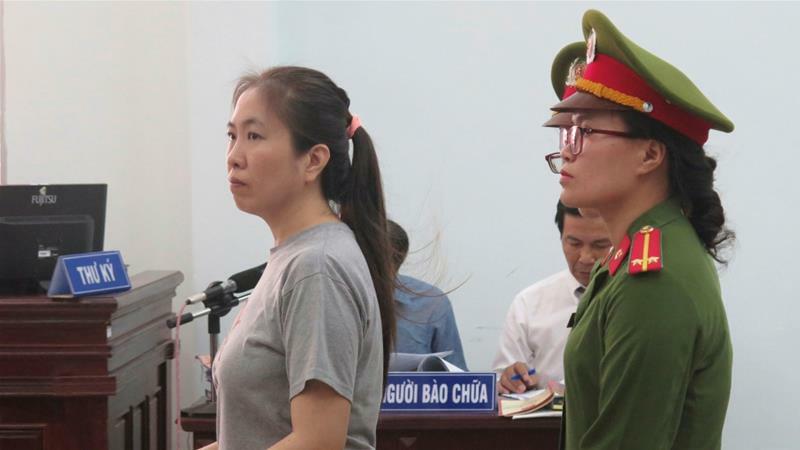 Ðài and Hà’s arrests came a month before the 12th National Congress of the ruling Communist Party of Vietnam (CPV). Past party congresses were usually preceded by an escalation of crackdown on human rights advocates and dissidents. “Brave human rights defenders like Ðài and Hà do not belong behind bars and must be allowed to freely conduct their legitimate work defending and educating others about the rights guaranteed by the Vietnamese Constitution and by international law,” says Robert Hårdh, Executive Director of Civil Rights Defenders. Stockholm-based Civil Rights Defenders announced earlier this month that its Civil Rights Defender of the Year award for 2015 has gone to Ms. Nguyễn Ngọc Như Quỳnh. She is Coordinator for the Vietnamese Bloggers Network and well-known for her use of social media to speak out against injustices and human rights abuses in Vietnam. Quỳnh has been blogging under the pseudonym of Me Nam (Mother Mushroom) and has openly criticised the Vietnamese government over human rights abuses and corruption. She began blogging in early 2006 when she paid a visit to a hospital and witnessed many poor people in the hot sun desperately waiting for treatment, but ignored because they lacked money to bribe hospital officials. Civil Rights Defenders reported about bloggers and the human rights movement in Vietnam in: We will not be silenced. Civil Rights Defenders – Civil Rights Defender of the Year 2015 – Nguyễn Ngọc Như Quỳnh.